This is the 12th Construction Phase Quarterly EM&A Report for the Project which summarizes the monitoring results and audit findings of the EM&A programme during the reporting period from 1 October 2018 to 31 December 2018. The key activities of the Project carried out in the reporting period included reclamation works and land-side works. Reclamation works included deep cement mixing (DCM) works, marine filling, seawall construction, laying of sand blanket, and prefabricated vertical drain (PVD) installation. Land-side works involved mainly foundation and substructure work for Terminal 2 expansion, modification and tunnel work for Automated People Mover (APM) and Baggage Handling System (BHS), and preparation work for utilities, with activities include site establishment, site office construction, road and drainage works, cable ducting, demolition of existing facilities, piling, and excavation works. 1. In order to maximize the utilization of public fill, the AAHK has been working closely with government departments in setting up sorting facilities in Tseung Kwan O Fill Bank (TKOFB) and Tuen Mun Fill Bank. 2. A contractor of DCM contract has started using technology-based solutions to implement DEZ monitoring. Combining the use of weatherproof and high image quality network cameras, and monitoring at site office, the solution has improved manpower deployment and monitoring during adverse weather. 3. The AAHK launched an Environmental Recognition Scheme for the Project since July 2018 to promote environmental awareness and good environmental practices in construction sites. Four contractors have been awarded for their good environmental performance. The monitoring works for construction dust, construction noise, water quality, construction waste, landscape & visual, terrestrial ecology, and CWD were conducted during the reporting period in accordance with the Manual. An additional coral post-translocation monitoring survey was also conducted in the reporting period. Monitoring results of construction dust, construction noise, construction waste, CWD, and coral post-translocation monitoring did not trigger the corresponding Action and Limit Levels in the reporting period. The water quality monitoring results for dissolved oxygen (DO) and total alkalinity obtained during the reporting period did not trigger their corresponding Action and Limit Levels stipulated in the EM&A programme. Relevant investigation and follow-up actions will be conducted according to the EM&A programme if the corresponding Action and Limit Levels are triggered. For turbidity, suspended solids (SS), chromium, and nickel, some of the testing results triggered the relevant Action or Limit Levels in the reporting period and corresponding investigations were conducted accordingly. The investigation findings concluded that the cases were not related to the Project. To conclude, the construction activities in the reporting period did not introduce adverse impact to all water quality sensitive receivers. The monthly terrestrial ecology monitoring on Sheung Sha Chau observed that there was no encroachment of any works upon the egretry area nor any significant disturbance to ardeids at Sheung Sha Chau by the works. A complaint regarding dust nuisance from sand barges in Tuen Mun was received on 6 Nov 2018. ET found that there was one contractor deployed sand delivery vessels for the Project in recent months. Photo records provided by the contractor confirmed that dust mitigation measures were implemented during stopover/anchored at Tuen Mun Anchorage Area. ET will keep reminding contractors to continue the implementation of dust mitigation measures and conduct regular training for all frontline staff. No notification of summons or prosecution were received. Starting from 25 Oct 2018, water quality monitoring at SR1A was commenced. ^Only triggering of Action or Limit Level found related to Project works is counted as Breach of Action or Limit Level. The updated overall phasing programme of all construction works was presented in Appendix A of the Construction Phase Monthly EM&A Report No. 7 and the contract information was presented in Appendix A of the Construction Phase Monthly EM&A Report No. 36. This is the 12th Construction Phase Quarterly EM&A Report for the Project which summarizes the key findings of the EM&A programme during the reporting period from 1 October 2018 to 31 December 2018. The Project’s organisation structure is provided in Appendix A. Contact details of the key personnel have been updated and provided in and Table 1.1. The contact information for the Project is provided in Table 1.2. The public can contact us through the following channels if they have any queries and comments on the environmental monitoring data and project related information. The locations of the works areas are presented in Figure 1.1 to Figure 1.2. The status for all environmental aspects is presented in Table 1.3. The EM&A requirements remained unchanged during the reporting period. The baseline water quality monitoring result has been reported in Baseline Water Quality Monitoring Report and submitted to EPD under EP Condition 3.4. 6 months of baseline surveys before the commencement of land formation related construction works. Passive Acoustic Monitoring (PAM): For the whole duration of baseline period. At least 3 months before the commencement of construction works on the formed land of the Project. Taking into account the construction works in the reporting period, impact monitoring of air quality, noise, water quality, waste management, terrestrial ecology, landscape & visual, and CWD were carried out in the reporting period. Upon completion of coral translocation in January 2017, a summary of the ensuing post-translocation monitoring is reported quarterly. ● One EPD sharing on key issues of waste management and construction dust control. Impact 1-hour Total Suspended Particulates (TSP) monitoring was conducted three times every six days at two representative monitoring stations during the reporting period. The locations of monitoring stations are described in Table 2.1 and presented in Figure 2.1. The Action and Limit Levels of the air quality monitoring stipulated in the EM&A programme for triggering the relevant investigation and follow-up procedures under the programme are provided in Table 2.1 for reference. The air quality monitoring results in the reporting period are summarized in Table 2.2 and the graphical plot is presented in Appendix C.
Note: The percentages are calculated by dividing the number of monitoring results within their corresponding Action and Limit Levels by the total number of monitoring results. All monitoring results were within their corresponding Action and Limit Levels at all monitoring stations in the reporting period. General meteorological conditions from the last month of previous quarter to this reporting period were recorded and summarized in Table 2.3. No dust emission source from Project activities was observed during impact air quality monitoring. Major sources of dust observed at the monitoring stations during the monitoring sessions were local air pollution and nearby traffic emissions. It is considered that the monitoring work in the reporting period was effective and there was no adverse impact attributable to the Project activities. Impact noise monitoring was conducted at four representative monitoring stations once per week during 0700 and 1900 in the reporting period. The locations of monitoring stations are described in Table 2.4 and presented in Figure 2.1. The Action and Limit Levels of the noise monitoring stipulated in the EM&A programme for triggering the relevant investigation and follow-up procedures under the programme are provided in Table 2.4 for reference. (i) Reduced to 70dB(A) for school and 65dB(A) during school examination periods at NM4. School examination took place from 9 to 15 November in this reporting period. The noise monitoring results in the reporting period are summarized in Table 2.5 and the graphical plot is presented in Appendix C.
As the construction activities were far away from the monitoring stations, major sources of noise dominating the monitoring stations observed during the monitoring sessions were road traffic and aircraft noise near NM1A, school activities at NM4, and aircraft and helicopter noise near NM5 and NM6. It is considered that the monitoring work in the reporting period was effective and there was no adverse impact attributable to the Project activities. During the reporting period, water quality monitoring was conducted three days per week, at mid-flood and mid-ebb tides, at a total of 23 water quality monitoring stations, comprising 12 impact (IM) stations, 8 sensitive receiver (SR) stations, and 3 control (C) stations in the vicinity of the water quality sensitive receivers around the airport island in accordance with the Manual. The purpose of water quality monitoring at the IM stations is to promptly capture any potential water quality impacts from the Project before the impacts could become apparent at sensitive receivers (represented by the SR stations). Table 2.6 describes the details of the monitoring stations. Figure 2.2 shows the locations of the monitoring stations. (1) With the operation of HKBCF, water quality monitoring at SR1A station was commenced on 25 October 2018. The Action and Limit Levels for general water quality monitoring and regular DCM monitoring stipulated in the EM&A programme for triggering the relevant investigation and follow-up procedures under the programme are presented in Table 2.7. The control and IM stations during flood tide and ebb tide for general water quality monitoring and regular DCM monitoring are presented in Table 2.8. 1. For DO measurement, Action or Limit Level is triggered when monitoring result is lower than the limits. 2. For parameters other than DO, Action or Limit Level of water quality results is triggered when monitoring results is higher than the limits. 1. As per findings of Baseline Water Quality Monitoring Report, the control reference has been changed from C3 to SR2 from 1 Sep 2016 onwards. The summary or results within their corresponding Action and Limit Levels in the reporting period are presented in Table 2.9. The weather and sea conditions from September to December 2018 were recorded and summarized in Table 2.10. It should be noted that Super Typhoon Yutu affected Hong Kong from 1 to 2 November 2018 and water quality monitoring results might be affected by this weather event. Note: The percentages are calculated by dividing the number of depth-averaged results complying with their corresponding Action and Limit Levels by the total number of depth-averaged results. The monitoring results for DO and total alkalinity obtained in the reporting period were within their corresponding Action and Limit Levels stipulated in the EM&A programme. Relevant investigation and follow-up actions will be conducted according to the EM&A programme if the corresponding Action and Limit Levels are triggered. For turbidity, SS, chromium, and nickel, some of the testing results triggered the relevant Action or Limit Level in the reporting period, and investigations were conducted accordingly. Summaries of results triggering Action or Limit Level for turbidity, SS, chromium, and nickel are presented in Table 2.11 to Table 2.16. Details of the investigation findings were presented in Construction Phase Monthly EM&A Report No. 34, 35 and 36, which concluded that all results triggering the Action or Limit Level were not related to the Project. Note: The monitoring results on monitoring dates not presented in the above tables did not trigger their corresponding Action or Limit Levels. Detailed results are presented in Appendix C.
No water quality monitoring conducted at SR1A before the operation of HKBCF. In the reporting period, it is noted that most monitoring results were within their corresponding Action and Limit Levels, while minor number of results triggered their corresponding Action or Limit Level, and investigations were conducted accordingly. Based on the findings presented in Construction Phase Monthly EM&A Report No. 34, 35 and 36, all cases that triggered the corresponding Action or Limit Level were not related to the Project; hence, the Project did not introduce adverse impact to all water quality sensitive receivers. All required actions under the Event and Action Plan were followed. Nevertheless, the non-project related triggers were attended to and initiated corresponding action and measures. As part of the EM&A programme, the construction methods and mitigation measures for water quality will continue to be monitored and opportunities for further enhancement will continue to be explored and implemented where possible, to strive for better protection of water quality and the marine environment. In the meantime, the contractors were reminded to implement and maintain all mitigation measures during weekly site inspections. These include maintaining the silt curtain for sand blanket laying properly and maintaining the levels of materials on barges to avoid overflow as recommended in the Manual. In accordance with the Manual, waste generated from construction activities was audited once per week to determine if wastes were being managed in accordance with the Waste Management Plan (WMP) prepared for the Project, contract-specific WMP, and any statutory and contractual requirements. All aspects of waste management including waste generation, storage, transportation, and disposal were assessed during the audits. The Action and Limit Levels of the construction waste are provided in Table 2.17. Weekly monitoring of the Project construction works was carried out by the ET in the reporting period to check and monitor the implementation of proper waste management practices during the construction phase. Based on updated contractors’ information, summary of construction waste generated in the reporting period is presented in Table 2.18. 1. C&D refers to Construction and Demolition. 2. Figures are rounded off to the nearest tonne. 3. Paper, metals and/or plastics were recycled in the reporting period. CWD monitoring was conducted by vessel line transect survey at a frequency of two full surveys per month, supplemented by land-based theodolite tracking survey and PAM. The frequency of the land-based theodolite tracking survey during the construction phase was one day per month at both Sha Chau (SC) and Lung Kwu Chau (LKC) stations as stipulated in the Manual. Additional theodolite tracking surveys for one day at SC station and two days at LKC station were conducted on a voluntary basis to collect supplementary information for the Project, such that a total of two tracking days at SC station and three tracking days at LKC station were conducted per month. The vessel survey transects followed the transect lines proposed in the Manual and are consistent with those used in the Agriculture, Fisheries and Conservation Department (AFCD) long-term CWD monitoring programme. The transect locations of CWD monitoring by vessel line transect survey conducted from October to December 2018 are shown in Figure 2.3, whilst the land-based theodolite tracking survey stations are described in Table 2.19 and depicted in Figure 2.4. The location of the PAM device is shown in Figure 2.10. The Action Level and Limit Level for CWD monitoring were formulated by an action response approach using the running quarterly dolphin encounter rates (STG and ANI) derived from baseline monitoring data, as presented in the CWD Baseline Monitoring Report. The derived values of Action and Limit Levels for CWD monitoring are shown in Table 2.20. During the October to December 2018 reporting period, a total of six sets of vessel line transect survey covering all transects in Northeast Lantau (NEL), Northwest Lantau (NWL), Airport West (AW), West Lantau (WL) and Southwest Lantau (SWL) survey areas were conducted at a frequency of twice per month, in each survey area. A total of around 1,345 km of survey effort was collected from these surveys, with around 91.8% of the total survey effort being conducted under favourable weather condition (i.e. Beaufort Sea State 3 or below with favourable visibility). Details of the survey effort data are presented in Appendix C.
From October to December 2018, there were a total of 42 sightings of CWDs, with 140 dolphins sighted (Table 2.21). Amongst the sightings of CWDs, 39 sightings with 128 dolphins were made during on-effort searches under favourable weather conditions. When breaking down the sightings by survey areas, 12 sightings with 35 dolphins, 24 sightings with 89 dolphins and 5 sightings with 15 dolphins were recorded in NWL, WL and SWL survey areas respectively during the current reporting period. In addition, one CWD sighting consisting of a single individual was recorded in NEL survey area in October 2018, which was the second CWD sighting of NEL survey area for the CWD monitoring of 3RS Project after the first sighting made in August 2018. No CWD was sighted on AW transects. Compared with the last quarter (i.e. July to September 2018), there is an overall observable decline in terms of both number of CWD sightings and number of dolphins (decreased by around 34% and 30% respectively). Both WL and SWL showed observable decline in terms of both number of CWD sightings and number of dolphins (WL: decreased by around 40% and 35% respectively; SWL: decreased by around 58% and 56% respectively). On the contrary, the number of CWD sighting in NWL remained similar to the last quarter and there was even an increase in terms of number of dolphins (i.e. increased by around 21%). The decrease in the number of CWD sightings and number of dolphins in the fourth quarter is primarily due to seasonal variation, making reference to previous AFCD marine mammals monitoring records, the third quarter has normally been the peak season for CWDs in Hong Kong (Figure 4.2 of the 3RS CWD Baseline Monitoring Report refers). Compared with the same quarter of last year in 2017 (i.e. October to December 2017), there is an overall slight decrease of CWD records, in terms of both the number of sightings (about 11%) and the number of dolphins (about 17%). The decrease is most pronounced in NWL in terms of the number of dolphins (about a 44% decrease). Table 2.21 below shows the comparison of the numbers of sightings and dolphins amongst the current reporting period, last quarter, and the same quarter of year 2017. The distribution of CWD sightings recorded from October to December 2018 is illustrated in Figure 2.5. In NEL, the single sighting was recorded on the second transect from the western side of the transect area within the Brothers Marine Park. 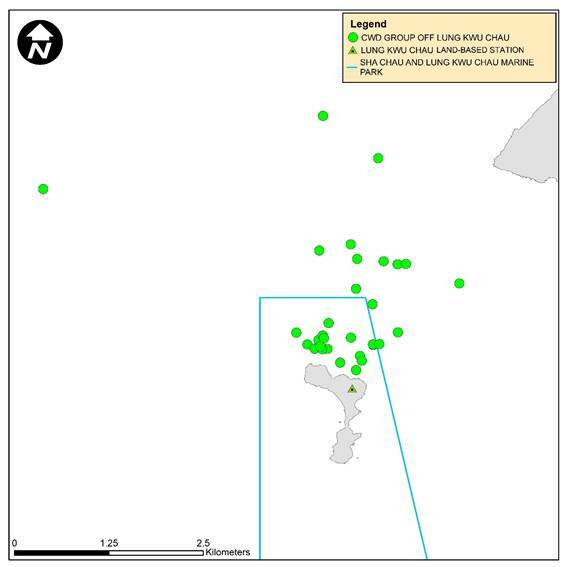 In NWL, the majority of the sightings were located within and around SCLKCMP, particularly the northern part; a few CWD sightings were recorded in the southwestern corner of the survey area, while no CWD was sighted in close vicinity to the 3RS works area. In WL, CWD sightings were distributed across the entire survey area with more sightings recorded in the waters from Peaked Hill to Fan Lau. In SWL, CWD sightings were all towards the western side of the transect area. Details of the sighting data are presented in Appendix C.
Remarks: Please note that there are 42 pink circles on the map indicating the sighting locations of CWD. Some of them were very close to each other and therefore appear overlapped on this sighting distribution map. The dolphin encounter rates for the number of on-effort dolphin sightings per 100 km survey effort (STG) and for the total on-effort number of dolphins per 100 km survey effort (ANI) in the whole survey area (i.e. NEL, NWL, AW, WL and SWL) for October, November and December 2018 are summarized in Table 2.22. In this reporting period, both the monthly STG and ANI increased from October to November but then decreased substantially in December. The running quarterly STG and ANI encounter rates declined, although the Action Level (running quarterly STG < 1.86 & ANI < 9.35) was not triggered. Compared with the previous reporting period, the running quarterly STG decreased from 4.82 to 3.16 and the ANI from 15.32 to 10.36, which is likely due to seasonal variation that, making reference to previous AFCD marine mammals monitoring records, where the third quarter has normally been the peak season for encountering CWDs as mentioned in the previous section. While comparing with the same quarter of last year (i.e. October to December 2017), both running quarterly STG and ANI in each month were lower than the same period in 2017, from 4.05 to 3.16 and 14.75 to 10.36 respectively. As there is no significant change in deployment of works vessels and barges in this quarter comparing with the previous reporting quarter and the same quarter of last year (although there were notably reduced ground improvement works barges operating in the period), there is no obvious relationship between 3RS marine works activities and the decrease of running quarterly encounter rates in this reporting period. It is also worth noting there was a rise in monthly STG and ANI levels recorded in November 2018 that contrasts significantly with the drop in both as recorded in November 2017. Note: For detailed calculations of encounter rates STG and ANI, please refer to the Construction Phase Monthly EM&A Report No. 34, 35 and 36. Between October and December 2018, the group size of CWD sightings ranged from 1 to 11 dolphins. The average group size of CWDs was 3.3 dolphins per group while that of the last quarter was 3.1, which is quite similar. The average group size of CWDs in this reporting quarter is slightly lower than that of the same quarter of last year (3.6 dolphins per group). In this reporting quarter, the numbers of CWD sightings with small group size (i.e. 1-2 dolphins) and medium group size (i.e. 3-9 dolphins) were the same. Amongst all 42 sightings, there were two sightings with large group size (i.e. 10 or more dolphins). These two large CWD groups were sighted in WL and SWL respectively. Sighting locations of CWD groups with different group sizes are depicted in Figure 2.6. In NWL, medium-sized CWD groups tended to appear in the waters north to Lung Kwu Chau. In WL, CWD sightings with medium group size were scattered over the survey area while small-sized groups were mostly recorded around Peaked Hill. The larger CWD group encountered in WL was recorded in waters between Peaked Hill and Fan Lau. In SWL, all sightings were small-sized except for one large CWD group, and all these groups were restricted to western side of the survey area. Remarks: Please note that there are 42 circles on the map indicating the sighting locations of CWD. Some of them were very close to each other and therefore appear overlapped on this sighting distribution map. During October to December 2018, 10 sightings of CWDs were recorded with feeding activities. None of these sightings was observed in association with operating fishing boats. The number of sightings with feeding recorded in the current reporting period is slightly lower when compared to the last reporting period (12 sightings involved feeding activities with no association with operating fishing boats from July to September 2018). Compared with the data in the same quarter of last year, CWD sightings with feeding activities decreased by 4 sightings. The sighting locations of CWDs engaged in different behaviours during the current reporting period are illustrated in Figure 2.7. From October to December 2018, 10 sightings of CWDs were recorded with the presence of mother-and-unspotted calf, mother-and-unspotted juvenile and/or mother-and-spotted juvenile, which is slightly fewer than the last reporting quarter (i.e. 11 sightings between July and September 2018). The number is higher than the same quarter of last year (i.e. 8 sightings between October and December 2017). These pairs were sighted in NWL, WL and SWL survey areas as shown in Figure 2.8. During October to December 2018, a total number of 62 different CWD individuals were identified altogether for 95 times. Re-sighting information of CWD individuals provides an initial idea of their range use and apparent connection between different areas around Lantau. Amongst these 62 different CWD individuals, 23 animals (i.e. NLMM004, NLMM006, NLMM013, NLMM015, NLMM018, NLMM023, NLMM063, SLMM003, SLMM007, SLMM014, SLMM028, SLMM053, WLMM001, WLMM028, WLMM029, WLMM056, WLMM060, WLMM065, WLMM071, WLMM078, WLMM079, WLMM114 and WLMM127) were sighted for more than once. Seven individuals including NLMM063, SLMM014, SLMM028, WLMM001, WLMM060, WLMM071 and WLMM114 were re-sighted in different survey areas during this reporting period. 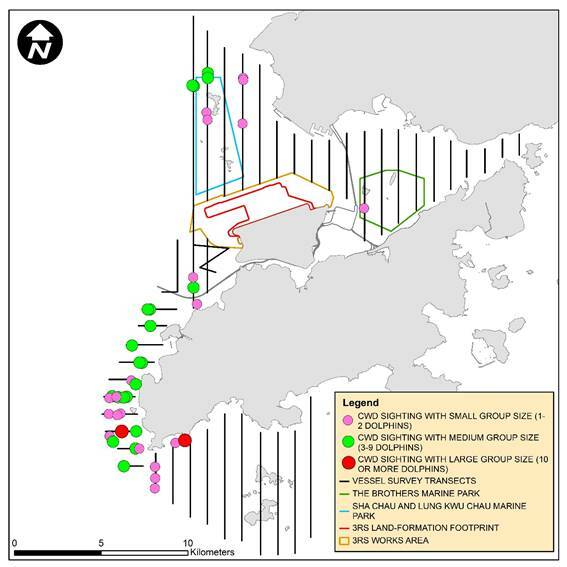 Amongst these seven animals, NLMM063, SLMM028, WLMM060 and WLMM071 had cross-area movement between NWL and WL survey areas, whilst SLMM014, WLMM001 and WLMM114 had cross-area movement between WL and SWL. The most frequently re-sighted individual in this reporting quarter was WLMM001 which has been encountered in each month of the current reporting quarter for altogether 6 times. The number of re-sighted CWD individuals and the number of CWD individuals showing cross-area movement from October to December 2018 were both lower than the last reporting quarter. A summary of photo identification works is presented in Table 2.23. Representative photos of the 62 identified individuals and figures depicting the sighting locations of the aforementioned 23 re-sighted individuals recorded in this reporting period are presented Appendix C.
During October to December 2018, a total of 15 days of land-based theodolite tracking survey effort were completed, including nine days on Lung Kwu Chau and six days on Sha Chau. In total, 31 CWD groups were tracked from the Lung Kwu Chau station while no CWD groups were tracked from the Sha Chau station, with an overall 0.34 CWD groups sighted per survey hour. Information on survey effort and CWD groups sighted during land-based theodolite tracking surveys are presented in Table 2.24. Details on the survey effort and CWD groups tracked are presented in Appendix C. The first sighting locations of CWD groups tracked between October and December 2018 are shown in Figure 2.9. Remarks: Please note that there are 31 green circles on the map indicating the first sighting locations of CWD groups tracked off Lung Kwu Chau. Some of them were very close to each other and therefore appear overlapped on this map. 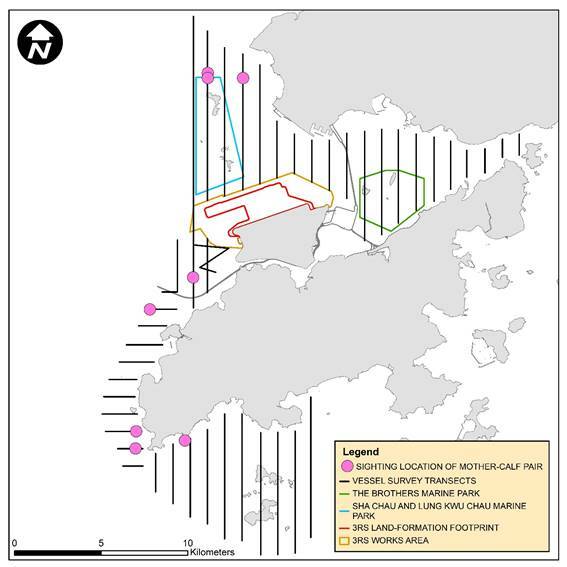 An Ecological Acoustic Recorder (EAR) has been deployed and positioned to the south of Sha Chau Island inside the SCLKCMP (Figure 2.10) with 20% duty cycle, while data from the EAR intended primarily to supplement the data collected from the land-based theodolite tracking survey station on Sha Chau. In this reporting period, the EAR has been retrieved on 16 October and 28 November 2018 for data collection and subsequently redeployed. The EAR deployment is generally for 6 weeks prior to data retrieval for analysis. As the period of data collection and analysis takes more than four months, PAM results could not be reported in quarterly intervals but report for supplementing the annual CWD monitoring analysis. During the reporting period, silt curtains were in place by the contractors for sand blanket laying and marine filling works, in which dolphin observers were deployed by each contractor in accordance with the Marine Mammal Watching Plan (MMWP). Teams of at least two dolphin observers were deployed at 12 to 18 dolphin observation stations by the contractors for continuous monitoring of the DEZ by all contractors for ground improvement works (DCM works and PVD installation) and seawall construction in accordance with the DEZ Plan. Trainings for the proposed dolphin observers on the implementation of MMWP and DEZ monitoring were provided by the ET prior to the aforementioned works, with a cumulative total of 677 individuals being trained and the training records kept by the ET. Observations were recorded on DEZ monitoring in this reporting period during site inspection by the ET and IEC. The contractors had taken actions to implement the recommended measures. From the contractors’ MMWP observation records and DEZ monitoring records, no dolphin or other marine mammals were observed within or around the silt curtains or the DEZ in this reporting period. The contractors’ records were also audited by the ET during site inspection. Audits of acoustic decoupling for construction vessels were carried out during weekly site inspection and summarized in Section 2.6. Summary of audits of SkyPier HSFs route diversion and speed control and construction vessel management are presented in Section 2.8 and Section 2.9 respectively. Site inspections of the construction works were carried out on a weekly basis to monitor the implementation of proper environmental pollution control and mitigation measures for the Project. Bi-weekly site inspections were also conducted by the IEC. Besides, ad-hoc site inspections were conducted by ET and IEC if environmental problems were identified, or subsequent to receipt of an environmental complaint, or as part of the investigation work. These site inspections provided a direct means to reinforce the specified environmental protection requirements and pollution control measures in construction sites. 1. In order to maximise the utilisation of public fill, sorting facilities were set up in Tseung Kwan O Fill Bank (TKOFB) in 2018. AAHK is in close liaison with government departments on measures to facilitate the intake of the public fill material from TKOFB. Another sorting facility is being set up in Tuen Mun Fill Bank to step up the use of public fill materials in reclamation works, with target commencement of operation in the first quarter of 2019. With the setting up of more sorting facilities, AAHK aims to maximise the intake of suitable public fill materials in the 3RS project. Suitable C&D materials generated from other AAHK’s projects and local infrastructure projects are also being used as fill in reclamation works of 3RS Project. 2. In December 2018, a contractor of DCM contract started using a closed-circuit television (CCTV) system combining high-resolution network cameras with high definition televisions (HDTV) and a management software to implement continuous DEZ monitoring instead of deploying dolphin observers on barges. The network cameras were fixed on DCM barges to overlook the DEZ, while dolphin observers monitored the live views of all DEZs at a work station in the site office comprising large HDTV displays. The weatherproof and high image quality cameras capture views of all DEZs for the monitoring by dolphin observers in daytime, night-time and even during adverse weather conditions. The CCTV system allows dolphin observers to control camera(s) for searching dolphin and to capture image from the live view whenever there is presence of suspected dolphin within or near the DEZ. The dolphin observers could inform the site supervision team immediately to instruct suspension of the works directly in the site office when dolphin was observed within the DEZ. 3. From July 2018, the AAHK launched an Environmental Recognition Scheme for 3RS work contracts to promote environmental awareness and good environmental practices in construction sites. Four contractors have been awarded for their good environmental performance. The assessment criteria include site performance, environmental submissions, training effort to frontline staff, worker environmental awareness and outstanding environmental practices. Assessments were carried out in a quarterly basis. Besides, advices were given when necessary to ensure the construction workforce were familiar with relevant procedures, and to maintain good environmental performance on site. Regular toolbox talks on environmental issues were organized for the construction workforce by the contractors to ensure understanding and proper implementation of environmental protection and pollution control mitigation measures. Monthly ecological monitoring was carried out in October, November and December 2018 on Sheung Sha Chau Island in accordance with the Manual. No encroachment of any works upon the egretry area nor any significant disturbance to the ardeids foraging at Sheung Sha Chau by the works were recorded during ecological monitoring. No signs of breeding or nursery activities were observed. At the HDD daylighting location, neither nest nor breeding activity of ardeids were found during the monthly ecological monitoring and weekly site inspections from October to December 2018. The site photos and location map regarding the ecological monitoring for HDD daylighting location and egretry area are provided in Appendix C for reference. In total, 2,663 ferry movements between HKIA SkyPier and Zhuhai / Macau were audited in the reporting period. The daily movements of all SkyPier HSFs in the reporting period ranged between 86 and 102, which fell within the maximum daily cap number of 125. The average speeds of all HSFs travelling through the Speed Control Zone (SCZ) ranged from 9.0 to 20.3 knots. 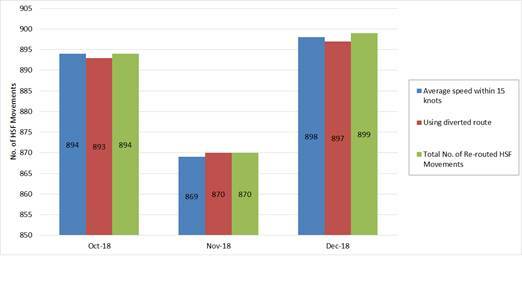 Except two cases (one case on 06 November 2018 and one case on 18 December 2018), all HSFs travelled through the SCZ with average speed within 15 knots in compliance with the Marine Travel Routes and Management Plan for High Speed Ferries of SkyPier (the SkyPier Plan). For the case on 06 November 2018, ET reviewed the supplementary response provided by ferry operator and agreed the speeding was due to ferry operator fault. For the case on 18 December 2018, ET’s investigation found that the deviation was due to giving way to a lot of fishing vessels. Two ferry movements were recorded with minor deviations from the diverted route. Notices of deviation were sent to the ferry operators and the cases were investigated. The cases involved giving way to other vessels to ensure public safety, and the HSFs had returned to the normal route following the SkyPier Plan as soon as practicable after the incidents. One ferry movement was recorded with deviations from the diverted route. The case involved a vessel suffering from serious rolling and pitching after failure of water jet pump, and the captain decided to finish the trip not via the SCZ to minimize travelling time and ensure safety. The summary of the SkyPier Plan monitoring result is presented in Graph 3. Insufficient or no AIS data cases were received from some HSFs during the reporting period. After investigation, it was found that AIS data for the concerned ferries were missing due to signal interference as reported by the ferry operators after checking the condition of the AIS transponders. Vessel captains were requested to provide the radar track photos which indicated the vessels entered the SCZ through the gate access points and there was no speeding in the SCZ. Ferry operators’ explanations were accepted. On the implementation of the updated Marine Travel Routes and Management Plan for Construction and Associated Vessels (MTRMP-CAV), the Marine Surveillance System (MSS) automatically recorded deviation cases such as speeding, entering no entry zone, and not traveling through the designated gates. ET conducted bi-weekly audit of relevant information including AIS data, vessel tracks and other relevant records to ensure sufficient information were provided by the system and the contractors complied with the requirements of the MTRMP-CAV. The contactors submitted endorsed 3-month rolling vessel plans for construction vessel activities to AAHK in order to help maintain the number of construction vessels to a practicable minimum. The IEC also performed audit on the compliance of the requirements as part of the EM&A programme. During the reporting period, deviations including speeding in the works area, entry from non-designated gates, and entering no-entry zones were identified. All the concerned captains were reminded by the contractor’s MTCC representative to comply with the requirements of the MTRMP-CAV. A total of 5 skipper training workshops were held by ET during the reporting period with 18 concerned captains of construction vessels associated with the 3RS contracts to familiarise them with the predefined routes, general education on local cetaceans, guidelines for avoiding adverse water quality impact, the required environmental practices / measures while operating construction and associated vessels under the Project, and guidelines for operating vessels safely in the presence of CWDs. Another 11 skipper training workshops were held with 18 captains by contractors’ Environmental Officers and competency tests were conducted subsequently with the trained captains by ET. It was observed that the number of deviation cases has gradually declined, which shows the reminders issued to and refresher training sessions provided by the Contractors had reinforced the skippers to follow the MTRMP-CAV requirements with improved performance. 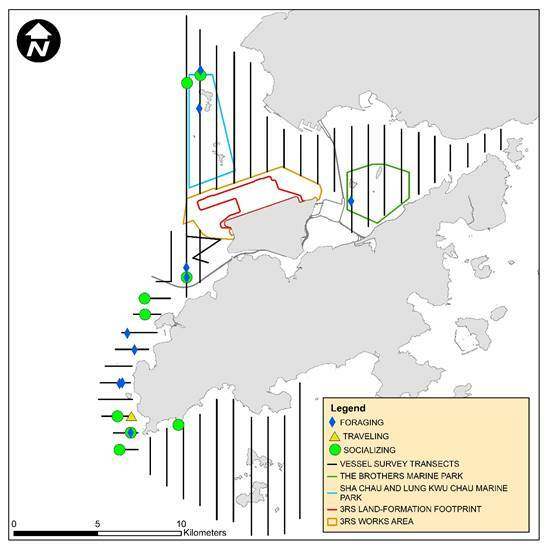 In accordance with the approved Coral Translocation Plan (CTP), gorgonian corals suitable for translocation were translocated to the recipient site at Yam Tsai Wan (YTW), with translocation completed in January 2017. Since then the post-translocation monitoring programme has been undertaken and was completed in April 2018. Two additional monitoring surveys (beyond the CTP requirement) scheduled in October 2018 and April 2019 were proposed in the Detailed Coral Translocation Report. This quarterly report presents the results of the 7th post-translocation monitoring survey completed in October 2018 (Table 2.25 below). (a) General health conditions of coral were measured on an ordinal scale of 0 to 5 (0=dead, 5=very healthy). (b) The percentage change in partial mortality of the tagged translocated and control corals are both determined by comparing the partial mortality recorded during each post-translocation monitoring with reference to the partial mortality observed during the baseline conditions, as represented by the tagged coral survey results. As with previous Quarterly EM&A Reports, the partial mortality is calculated based on baseline total length of each colony. (c) Coral showing no change in partial mortality is not presented in this account. (d) As defined in the approved CTP, the Action Level is triggered if during monitoring a 15% increase in the percentage of partial mortality occurs at more than 20% of the translocated coral colonies that is not recorded on the original (control) corals at the recipient site. (e) As defined in the approved CTP, the Limit Level is triggered if during monitoring a 25% increase in the percentage of partial mortality occurs at more than 20% of the translocated coral colonies that is not recorded on the original (control) corals at the recipient site. On 16 September 2018, one month prior to the survey, Typhoon Mangkhut hit Hong Kong with wind speeds up to 250 km/h. Many areas in Hong Kong including the recipient site were affected. As a result, two control coral colonies and 25 translocated coral colonies were lost. Therefore, only 18 control corals colonies and 60 translocated colonies were surveyed. Based on the results of the 7th post-translocation monitoring, ≥25% change was recorded on 57 out of 60 translocated corals (95% of the tagged translocated coral colony that were surveyed). Similarly, ≥25% change was recorded on 17 out of 18 control corals (94% of the tagged control coral colony that were surveyed) and no change in PM was recorded on one control coral. The health condition ranged from 0 to 3 for control corals and 0 to 4 for translocated corals. Other than the coral colonies that have been swept away during typhoon Mangkhut, the coral colonies (both control and translocated) that remain at the site have shown similar partial mortality to those recorded in April 2018 showing that the condition of coral colonies appear to have stabilized. Action and Limit Levels were not triggered during this round of monitoring. During the reporting period, environmental related licenses and permits required for the construction activities were checked. No non-compliance with environmental statutory requirements was recorded. One environmental complaint was received in the reporting period. All environmental complaints were attended to and investigation was conducted by the ET in accordance with the Manual and the Complaint Management Plan. The summary of the complaints and analysis is presented in Table 3.1. A complaint was received on 6 Nov 2018 regarding dust nuisance from sand barges at Tuen Mun. Investigation was conducted by the ET in accordance with the Manual and the Complaint Management Plan of the Project. The anonymous complainant did not provide any specific information (e.g. date, time, name of vessels) on the case. In recent months, only one contractor has deployed sand delivery vessels for 3RS Project, and photo records of implementation of dust mitigation measure, such as water spraying, were provided by the contractor. Considering that Tuen Mun Anchorage Area is one of the designated anchorage areas for all vessels in Hong Kong waters, including construction vessels of various construction projects. Based on the information provided by the complainant, there were no evidences suggesting that the Project’s sand delivery vessels caused dust nuisance to nearby residence at Tuen Mun. Nevertheless, ET will continue reminding all contractors to continue the implementation of dust mitigation measures and to conduct regular training for all frontline staff to avoid dust nuisance to the public. ET will also continue to monitor the implementation of dust mitigation measures. No notification of summons nor prosecution was received during the reporting period. Cumulative statistics on valid exceedance, non-compliance, complaints, notifications of summons and status of prosecutions are summarized in Table 3.2 and Table 3.3. Remark: Non-project related triggers of Action or Limit Level are not shown in this table. In this quarterly period from 1 October 2018 to 31 December 2018, the EM&A programme has been implemented as planned, including 96 sets of air quality measurements, 52 sets of construction noise measurements, 39 sets of water quality measurements, 6 complete sets of vessel line transect surveys and 15 days of land-based theodolite tracking survey effort for CWD monitoring, 3 rounds of terrestrial ecological monitoring, 1 set of additional coral post-translocation monitoring, as well as environmental site inspections and waste monitoring for the Project’s construction works. The key activities of the Project carried out in the reporting period included reclamation works and land-side works. Reclamation works included DCM works, marine filling, seawall construction, laying of sand blanket, and PVD installation. Land-side works involved mainly foundation and substructure work for Terminal 2 expansion, modification and tunnel work for APM and BHS, and preparation work for utilities, with activities include site establishment, site office construction, road and drainage works, cable ducting, demolition of existing facilities, piling, and excavation works. Monitoring results of construction dust, construction noise, construction waste, CWD, and coral post-translocation monitoring did not trigger the corresponding Action and Limit Levels in the reporting period. All site observations made by the ET were recorded in the site inspection checklists and passed to the contractor together with the recommended follow-up actions. For water quality, the water quality monitoring results for DO and total alkalinity obtained during the reporting period did not trigger their corresponding Action and Limit Levels stipulated in the EM&A programme. Relevant investigation and follow-up actions will be conducted according to the EM&A programme if the corresponding Action and Limit Levels are triggered. For turbidity, SS, chromium, and nickel, some of the testing results triggered the relevant Action or Limit Levels in the reporting period, and the corresponding investigations were conducted accordingly. The investigation findings concluded that the cases were not due to the Project. To conclude, the construction activities in the reporting period did not introduce adverse impact to all water quality sensitive receivers. In total, 2,663 ferry movements between HKIA SkyPier and Zhuhai / Macau were audited in the reporting period. Except the two cases (one case on 06 November 2018, and one case on 18 December 2018), all HSFs travelled through the SCZ with average speed within 15 knots in compliance with the SkyPier Plan. Three ferry movements had deviations from the diverted route during the reporting period, where two of them were minor deviations. ET investigated the deviation cases and confirmed that all of them were related to public safety or emergency situations. During the reporting period, ET conducted bi-weekly audit of the MSS to ensure the system recorded all deviation cases accurately and the contractors fully complied with the requirements of the MTRMP-CAV. A total of five skipper training workshops were held by ET during the reporting period for captains of construction vessels associated with 3RS contracts. Another 11 skipper training workshops were held by contractors’ Environmental Officers and competency tests were conducted subsequently with the trained captains by ET. On the implementation of MMWP, dolphin observers were deployed by the contractors for laying of silt curtains for sand blanket and marine filling works in accordance with the plan. On the implementation of DEZ Plan, dolphin observers were deployed for continuous monitoring of the DEZ by the contractors for ground improvement works (DCM works and PVD installation) and seawall construction in accordance with the DEZ Plan. Trainings for the proposed dolphin observers were provided by the ET prior to the aforementioned works, with the training records kept by the ET. From the contractors’ MMWP observation records and DEZ monitoring records, no dolphin or other marine mammals were observed within or around the silt curtains or the DEZ in this reporting period. Audits of acoustic decoupling for construction vessels were also carried out by ET. The recommended environmental mitigation measures, as included in the EM&A programme, were effectively implemented during the reporting period. Also, the EM&A programme implemented by the ET has effectively monitored the construction activities and ensured the proper implementation of mitigation measures.